Aladdin, a street rat, is the only person who can enter the cave of wonders and retrieve a magical lamp for the dark Vizier Jafar. 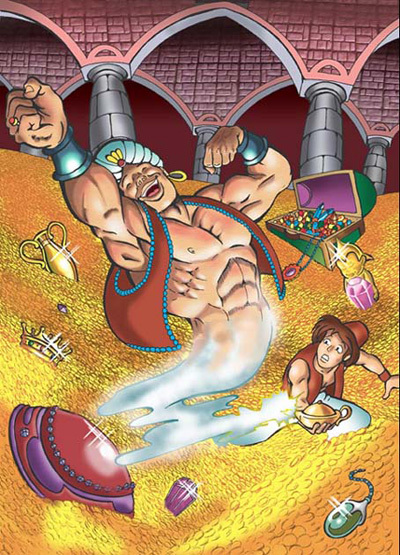 Aladdin becomes trapped in the cave with his sidekick, Abu, and accidentally discovers the resident of the lamp. Aladdin develops a relationship with the Genie and uses his wishes to become a prince to chase the affections of Princess Jasmine. When Jafar finally steals the lamp and gets three wishes of his own, Aladdin must rely on his intelligence to trick Jafar and save his friends and the Kingdom. Aladdin is an Academy Award-, Golden Globe- and Annie-Award winning 1992 animated feature produced by Walt Disney Animation Studios, and released by Walt Disney Pictures on November 25, 1992. The thirty-first animated feature in the Disney animated features canon, based on the Arab folktale Aladdin and the magic lamp from One Thousand and One Nights. Several characters and plot elements are also based on the 1940 version of The Thief of Bagdad. 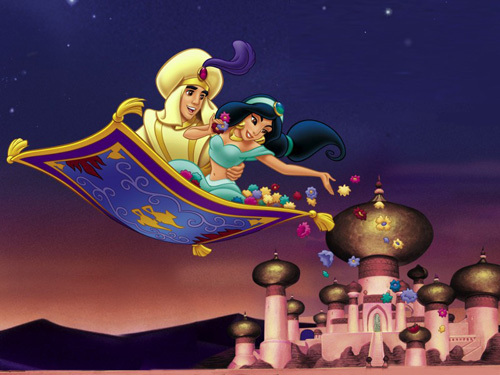 As is usual with Disney film adaptations, many aspects of the traditional story were changed for the film?for instance, the setting is changed from a mythical Islamic "China" to a fictional Arabian city, Agrabah. It was released at the peak stretch of the Disney renaissance era beginning with The Little Mermaid. It was the most successful film of 1992. Aladdin/Prince Ali Ababwa, is a poor but kind-hearted thief who lives in Agrabah. The Genie, is a comedic genie, with nigh omnipotent power, but can only be exercised when his master wishes it. Jafar, is the Grand Vizier of Agrabah. He is a tall and slim figure who wears dark and moody clothes and owns a pet parrot named Iago. Manipulative, impulsive, and downright remorseless, Jafar plots to use his sorcery to usurp the throne, kill Aladdin, and marry Jasmine. Princess Jasmine, is the princess of Agrabah. Sick and tired of life in the royal palace, she sneaks out to find a new life. According to the law, she must find a prince to marry before her next birthday. Abu, is Aladdin's kleptomaniac pet monkey with a squeaky voice. Carpet, a sentient magic carpet whom Aladdin and Abu meet inside the Cave of Wonders. 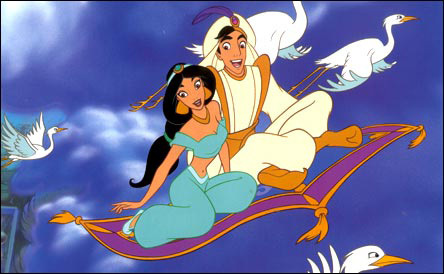 Carpet is Aladdin's primary mode of transportation in the film and one of the Genie's oldest friends. Iago, is Jafar's sarcastic, foul-mouthed pet parrot. The Sultan, is the pompous but kind ruler of Agrabah. He tries desperately to find a suitor for his daughter Jasmine. Razoul, is the head of the palace guards with a lust for killing and who desperately wants to capture Aladdin. He is extremely loyal to the Sultan and Jafar. Rajah, is Jasmine's pet tiger, whom she considers her only friend. The Peddler, is a mysterious merchant who appears at the beginning of the film. After promoting useless goods to the audience, he reveals the magic lamp and begins the story of Aladdin. 73 Witch Way Did She Go?